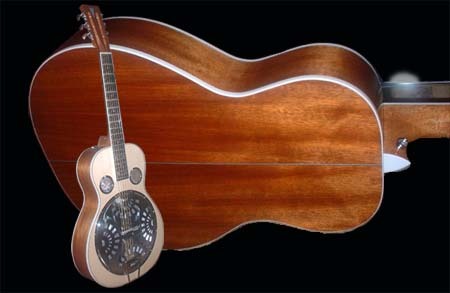 The SB resonator guitar is based upon the famous c.1930 Angelus Dobro model. The Rezolution SB resonator guitar spec has been brought right up to date to the standard you would want from a great resonator guitar. The SB uses a Quarterman cone, to give the very best cone tone, with the extra bass that the Quarterman cone has to offer. The SB can be supplied with either a “compromise” action for playing bottleneck style or with a high nut and action for lap style. The Rezolution resonator guitars have laminated tops and backs of aircraft grade Birch ply, topped with an overlay of the finish wood (Std = Spruce top with Mahogany back). The key to good resonator guitars is to hold the resonator cone as steady as possible, with a stiff guitar body. The sound will be dissipated and weak if the body is flimsy . In fact they have a lot in common with a speaker cabinet in that respect! Both the BB (biscuit bridge) and the SB (spider bridge) have fantastic “cone tone” and they are both LOUD! They are also great plugged in when fitted with the Headway pick-up, mounted either routed into the underside of the biscuit on the BB or mounted into a biscuit and trapped against the under side of the spider on the SB. Square-necks can also be made, but to order only. Fingerboard Ebony bound with Ebony, so no fret ends showing ! Tuners Gotoh butterbean slot-head; nickel or chrome as available. Each guitar is individually handmade using the very highest quality materials and construction techniques. In addition to the above, this guitar can be custom built to your specification - please see the Custom Guitars page. Quarterman cones are becoming harder to get and once I have used up my current stock of them, I will be switching to cones produced by the excellent Paul Beard at Resophonic Outfitters. Footnote: – Resonator guitars should, more properly, be called Ampliphonic guitars, as termed by the Dopyera’s, but 'Resonator' is now the generic term that has become commonly used.